Human CYSLTR2 / CYSLT2. BLAST analysis of the peptide immunogen showed no homology with other human proteins, except GPR109B (59%), OXGR1 (59%), GPR81 (59%). CYSLT2 / CYSLTR2 antibody was raised against synthetic 17 amino acid peptide from 1st extracellular domain of human CYSLTR2 / CYSLT2. Percent identity with other species by BLAST analysis: Human, Gibbon, Marmoset, Horse (100%); Gorilla, Monkey, Mouse, Panda (94%); Dog, Bovine, Hamster, Elephant, Rabbit, Opossum (88%); Pig (82%). Small volumes of anti-CYSLT2 antibody vial(s) may occasionally become entrapped in the seal of the product vial during shipment and storage. If necessary, briefly centrifuge the vial on a tabletop centrifuge to dislodge any liquid in the container`s cap. Certain products may require to ship with dry ice and additional dry ice fee may apply. Cysteinyl leukotriene receptor 2 (CysLT2) is a Chemoattractant Receptor that binds neutrophil chemoattractants such as cysteinyl leukotrienes. These ligands have potent proinflammatory activity and are implicated in many features of asthma including edema, bronchial constriction, and hyperreactivity (Bisgaard et al., 2000). Activation of cysteinyl leukotriene receptor 2 induces cell contraction and/or relaxation. 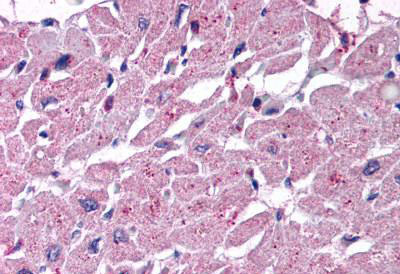 Anti-CYSLTR2 / CYSLT2 antibody IHC of human heart. Immunohistochemistry of formalin-fixed, paraffin-embedded tissue after heat-induced antigen retrieval. NCBI/Uniprot data below describe general gene information for CYSLT2. It may not necessarily be applicable to this product. CYSLTR2: Receptor for cysteinyl leukotrienes. The response is mediated via a G-protein that activates a phosphatidylinositol- calcium second messenger system. Stimulation by BAY u9773, a partial agonist, induces specific contractions of pulmonary veins and might also have an indirect role in the relaxation of the pulmonary vascular endothelium. The rank order of affinities for the leukotrienes is LTC4 = LTD4 >> LTE4. Belongs to the G-protein coupled receptor 1 family. 1. Suggest that endothelial and nonendothelial CysLT2R niches have separate roles in mediating inflammatory responses in ischemic/perfusion injury.